A U.S. Marine special ops team awakens from hypersleep in a long-abandoned underground laboratory complex with no memory of who they are or why they are there - and they are not alone. Something has infiltrated the complex. Casella 'Cash' Reese: [narration] The golden age had ended, and ended badly. Human kind and Cyborg kind had ceased to be partners. For 200 years they had built us to be their friends, do their bidding, fight their wars, cook their food, and share their beds. But the last of the great corporations was dead and gone. And with its passing began the dark time, when the humans hunted us for our parts, our circuitry, and our souls. And no one was safe. 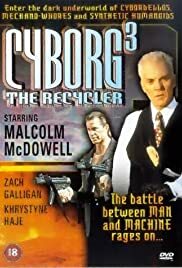 This is, at least in name, the third part of the Cyborg trilogy started by the 1989 Albert Pyun-Van Damme violent post apocalyptic epic, and followed by the sequel in title only with a very young Angelina Jolie. This movie is more of a sequel of the second part, both part 2 and 3 are not really related to Cyborg. Albert Pyun movie was great. Great action, great music, fast paced and violent. This movie is boring as hell, and its not violent. The music is not that good and it have a lots of dialogs, very poor ones for instance. Its not recommended, just to watch if its aired on TV a Sunday 4 PM and you don't have nothing else to do. A generous 5/10 only because i love post apocalyptic and cyborg movies.